Weekly roundup: Council votes on zoning changes, authorizes legal action against former B.A. 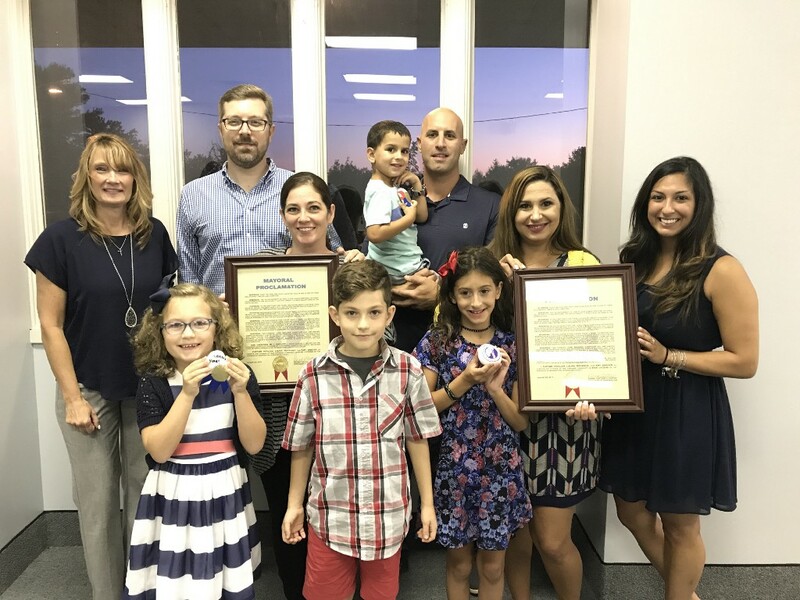 Mayor Joann Gattinelli (left) and Councilwoman Angela Donato (right) recognized residents and founders of Township Rock Amy Enever (holding proclamation on left) and Laura Rohanna (left of Donato) as star citizens for their efforts in getting children and families outside and active with the popular hide-and-seek rock art project. Pictured with them are, in the back from left, Enever’s husband Tom, and Rohanna’s son Paulie, 4, held by her husband Paul. In the front, from left, are Enever’s children Maddie, 7, and Will, 9, and Rohanna’s daughter Sofia, 9. Against many members of the public in attendance to last week’s meeting, Washington Township Council voted to change the zoning of 367 Hurffville Cross Keys Road, at the request of Kennedy Health from rural to institutional. Also, the council authorized Township Solicitor Stuart Platt to take legal action, including filing suit, against former Business Administrator Robert Smith. Check out more of the top stories from the past week in the Weekly Roundup. Many residents were in attendance at last week’s council meeting to share concerns on ordinances proposing to change the zoning of two Hurffville Cross Keys Road properties. Residents shared apprehensions about an ordinance that was up for adoption, extending the commercial zoning designation on 268 Hurffville Cross Keys Road to encompass the entire property, whereas at the time, a portion of the lot was zoned as rural. The ordinance was tabled. Council approved a second ordinance, by a vote of 3–2, to rezone 367 Hurffville Cross Keys Road from its rural designation to institutional, at the request of Kennedy Health System. Councilwomen Angela Donato and Dana Pasqualone voted no. In an effort to improve road safety for the start of the school year, Police Chief Patrick Gursick, Mayor Joann Gattinelli, Councilwoman Angela Donato and the township administration are making several updates to the roads near the Washington Township schools. Additionally, the township will provide increased police presence at Hurffville-Crosskeys Road at Newtown Commons and on Greentree Road at TLC Childcare. Buses stop at both locations and drivers often do not stop for the buses. The speed bumps at Birches were also re-striped.